For car hire, Arcachon is represented by six companies within the town centre. Five companies are located on Boulevard Du Général Leclerc and there is one (Hertz) located out of the town centre at Boulevard Mestrezat. Aquitaine is predominantly scenic countryside with beautiful beaches and the historic city of Bordeaux. All of these interesting places are accessible using car hire. Arcachon is an ideal town to use for a base. Online bookings can be made for all of the six rental companies or you simply order the vehicle when you arrive. The five town centre agencies are within a few metres of the railway station. The best way to travel there is to take the four-hour TGV train from Paris and then use a car hire. 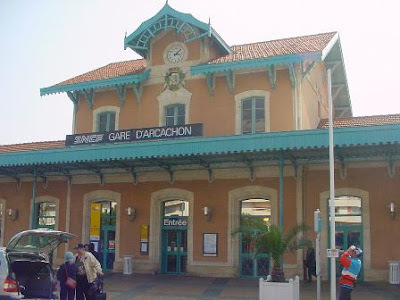 Arcachon is served by two TGV trains from Paris every day. The roads in Aquitaine are very quiet and driving in France is generally a pleasant experience. You need to take note of certain driving rules and basic information. The French drive on the right-hand side of the road and speed limits vary. They depend on the location and the weather conditions. Speed limits are reduced when it is raining. For example, the speed limit on toll motorways is 130 km/h in dry weather. It is 110 km/h in wet weather. The road signs generally indicate the place names rather than the road numbers. You'll need to carry the vehicle licence, driver's licence, insurance papers, and a luminous yellow vest inside the car. There also should be a mandatory warning triangle in the vehicle trunk. Radar detectors are illegal in France. The police fine motorists ‘on the spot’ if they are caught with one in a vehicle. French roads are seldom congested because of the use of toll motorways. You’ll need to make small cash or credit card payments at the toll booths. Seat belts must be worn by all occupants of the vehicle in France. All children under the age of ten years should be seated in the back seats of the car. There are additional special rules for babies in rear-facing specially adapted seats. All French garages carry 95/98 fuel grades and diesel. Large hypermarkets normally sell the cheapest fuel. Garages can be scarce in rural France and they often close for one-and-a-half to two hours during lunch. They’re usually closed on Sunday. The opening times are 9:00 till early evening during weekdays at the offices for car hire. Arcachon, like the rest of France, takes 12:00 or 12:30 till 14:00 as a lunch break. You'll also find the rental places open during Saturday morning. Prices are typically €300 to €400 per week for the rent of a Renault Clio with manual gearbox. All businesses will tell you that it is cheaper to book in advance, online. Judge for yourself. The charge includes for around 1700 km per week of mileage and, thereafter a charge per kilometre is made. The excess mileage charge could be in the region of 50 cents per kilometre.